The freakshow mentality has long outlived the literal freakshow. Now we look at people who are other than the norm safely from our living rooms, in faux scientific documentaries or reality TV shows. Like our Victorian ancestors we are frightened and thrilled, and fascinated and enchanted and entertained by strangeness. Fat, thin, lost or won the genetic lottery, born strange or deliberately making themselves strange: we celebrate and objectify people on the margins. I can’t help admiring people like the Schappell sisters, who manage to create good lives for themselves, despite an incredibly tough start and challenges that would daunt most. And I can’t help fretting about parents who make their children into fascinating freaks (perversity I am complicit in I confess). I love the aesthetics of early photography, and occasionally indulge myself buying old postcards and photos. With studio portraits of entertainers there is often an interesting tale to be tracked down – online newspaper archives such as Papers Past (in New Zealand) and Trove (in Australia) are wonderful places to browse and be distracted for hours. 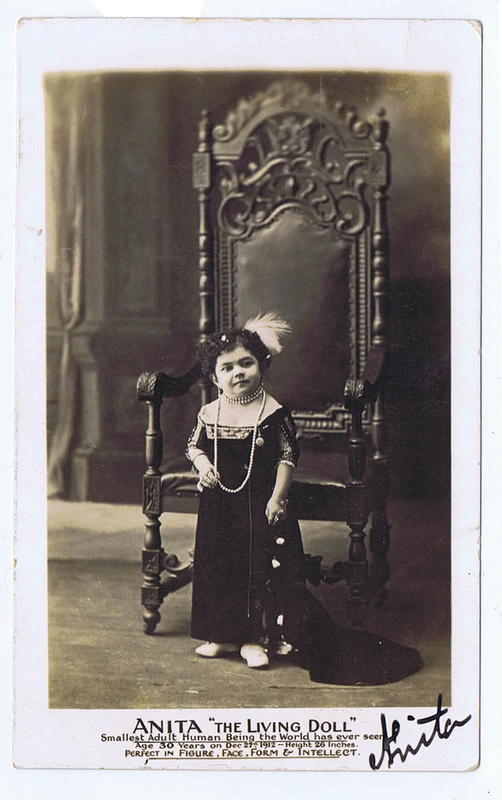 Anyway, yesterday, I received my latest $5 online auction purchase, a signed 1912 postcard of Anita, “The Living Doll”. Anita was a very small Hungarian woman who toured the world, met with royalty, always dressed elegantly, and managed to cultivate an aura of dignified intelligence. I hope her life was a happy one and that she retired to live the life she wished; I couldn’t find any mention of her after 1912. Anita hopefully did better than the young woman in another postcard I have, Ruby Westwood “The Giantess of Foxton”. 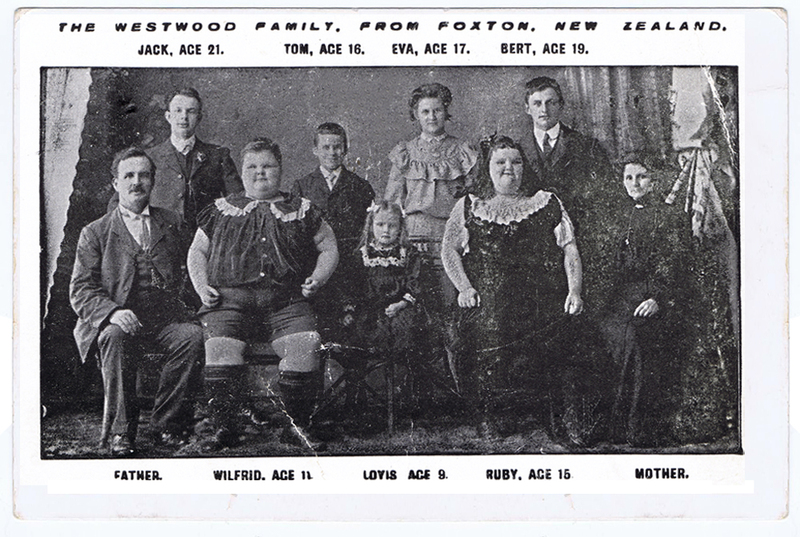 She and her brother supported a large family by exhibiting their unusual size, from when Ruby was about 7 years old. They traveled first through New Zealand, then to Australia, and eventually to the UK and beyond. But in San Francisco, at age just 19, Ruby pricked her finger on a rose stem, developed blood poisoning and died. Her brother Wilfred’s tale is not quite so sad. After Ruby’s death he managed to reinvent himself as a boy-wonder glass blower. As an adult he managed other entertainers, and traveled extensively, including through parts of Africa. Timespanner has compiled a lovely collection of clippings and photographs describing the lives of these “Perfect young giants”. It seems hard to imagine parents living off their children this way, but then I remember (though I wish I could forget) “Honey Boo boo” and her cohorts. This entry was posted in photography, portraits and tagged Anita, circus, dwarf, Foxton, freak, freak show, giant, giantess, postcard, ruby westwood, the living doll, Victorian. Bookmark the permalink.